Seriously, what else does this poll by Scripps tell us? Nearly two-thirds of Americans think it is possible that some federal officials had specific warnings of the Sept. 11, 2001, terrorist attacks on New York and Washington, but chose to ignore those warnings, according to a Scripps Howard News Service/Ohio University poll. 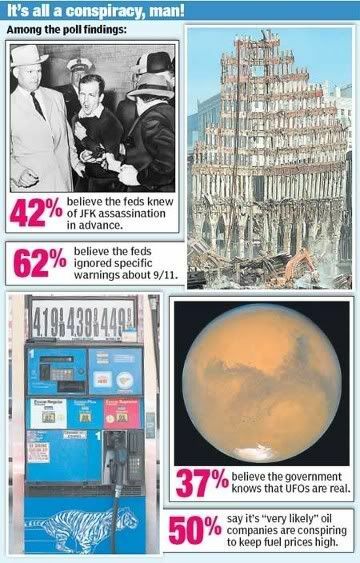 A national survey of 811 adult residents of the United States conducted by Scripps and Ohio University found that more than a third believe in a broad smorgasbord of conspiracy theories including the attacks, international plots to rig oil prices, the plot to assassinate President John F. Kennedy in 1963 and the government’s knowledge of intelligent life from other worlds. Well, one thing it tells us is that they probably over-sampled Democrats and Ron Paul supporters. IE, idiots. The other thing it tells us is that the Truthers are doing a good job in getting their wacko messages out there, and the debunkers aren’t. The high percentage is a manifestation, some say, of an American public that increasingly distrusts the federal government. It is wise to distrust government. I think I would be correct in stating that most of us on the conservative side almost completely distrust the federal government to take care of illegal immigration. We distrust its attempt, even under Republican leadership, to expand the powers of the federal government. We distrust the way they take and spend our money. We distrust their actionable capabilities. But, most of us are wise enough to understand that the government, whether it be Democrat or Republican, would not have stood by in the face of actionable intelligence about the 9/11 attacks. Had they known specifics, they would have done all they could to stop it. It is sad to say, but, the US actually got off light that day. It easily could have been 50K deaths, as many have said. It has been stated many times that if the planes had hit a 1/2 later, the death toll would have been much worse. I am not going to get in to the blame game. It has been argued to death over the years. What I have a huge problem believing is that, with all the conspiracy theories out there, not one person came forth prior to the attacks to say “hey, wait a minute. The government is going to (insert CT here.) Whether MILHOP or LILHOP, there would have been at least one person who was moral enough to come forth and blow the whistle. I have always argued that Truthers and their wacko theories should be treated with derision. I will admit, I was wrong. But, unfortunately, even arguing with facts doesn’t seem to work to well. People want to think the worst of government – yet, somehow, a good chunk of the population wants to put the feds in charge of our healthcare – and Trutherism feeds their appetite. And facts, cold, logical, scientific facts, are often boring, and do not feed the need for red meat. After four or five rewrites, those facts become blurred by the Truthers, and more interesting to the weak minded. Personally, I believe in UFO’s. Sound strange? Perhaps. I find it hard to believe that we are alone in this marvelous universe that God created. But, do I think that the government is covering up evidence? Na. They are just not that smart to keep that kind of secret. 9/11 an inside job? Forget it. Al Qaeda took advantage of our free and open society. Close one hole, and they would have taken advantage of another. And government is just not that smart to have kept an complicity quiet for all these years. There are certainly enough liberals in government who would have blown the whistle by now. The photo, via the NY Post, says quite a bit. If asked, I would certainly say that the government missed specific warnings about 9/11. But, not ignored. See much more at Memeorandum. If asked, I will believe in the conspiracy that Prozac was developed by the RNC in order to control liberals, though. Cross posted at Pirates Cove, with the help of Visitors from the planet Piratopia.